Celebrate Juneteenth at the 5th Ward Community Garden in Houston, Texas! 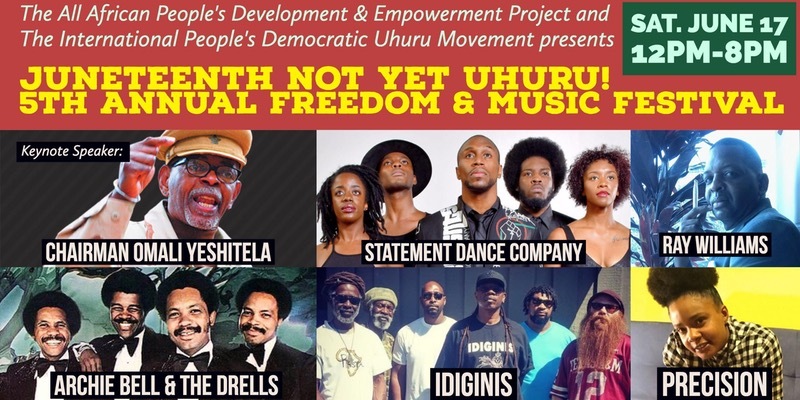 HOUSTON—The 5th annual Juneteenth Not Yet Uhuru Freedom and Music Festival will take place on June 17, 2017 at 3707 Brill Street in the 5th Ward Community Garden. This celebratory festival is sponsored by the All African People’s Development Project’s (AAPDEP) and the International People’s Democratic Uhuru Movement (InPDUM). It will be a day of fun and games for the kids, and a day of fantastic music led by “Tighten Up” fame R&B artist Archie Bell. In addition, the super Reggae Band Idiginis and R&B big band Ray Williams and the Majortones, along with the Hardest Working Man in Show Business with the James Brown Review insures a day of great music and cultural enlightenment. This will also be a day of serious discussion on the plight of African people all over the world. Omali Yeshitela, leader of the Uhuru Movement will lead the line-up of speakers including Dr. Aisha Fields, the International Director of AAPDEP and Kalambayi Andenet President InPDUM, along with other national and local representatives and activists. And equally important, this will be a day of economic development for the black community. The many vendors, from arts and crafts to great food will provide goods and services that are not available to us on a daily basis. It will be a day that we shop among ourselves and our resources stay in our community. One of the major goals of Juneteenth Not yet Uhuru is to build the One Africa! One Nation! Marketplace! This would be a permanent venue where African people can promote our own economic development enterprises. Juneteenth is the oldest known celebration commemorating the ending of chattel slavery in the United States. Dating back to 1865, it was on June 19th that the Union soldiers, led by Major General Gordon Granger, landed at Galveston, Texas with news that the war had ended and that the enslaved were now free, two and a half years after the issuance of the Emancipation Proclamation. However, in 2017 we are still not a free people. Our dire economic situation and the deadly relationship the black community has with the police throughout this country attest to this. That’s why this Juneteenth is titled "Juneteenth Not Yet Uhuru! Freedom and Music Festival." Uhuru is a Swahili word that means freedom. African drumming and dance, games for children, as well as arts & crafts. Vendors are welcomed and can contact us at 662-721-3053. For more information contact Omowale Kefing at 524-979-8133.